Dancers perform an item at the Grand Gala held inside the National Stadium on August 6. Thousands of Jamaicans, clad in the national colours of black, green and gold turned out at the national stadium on August 6, to celebrate the country’s 55th anniversary of political Independence, at the Grand Gala. Ms. Grange said Independence and Emancipation celebrations are important in fostering pride in country for both young and old people. 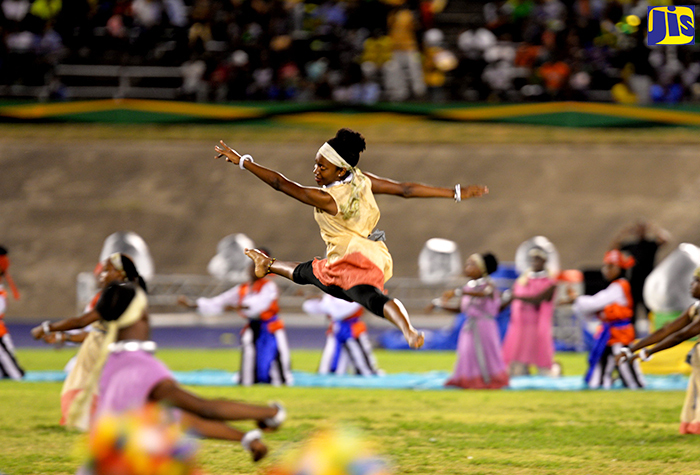 More than 2000 performers were on show from communities across Kingston and St. Andrew. There were also performances by Etana, Ernie Smith, Jermaine Edwards, Mr. Vegas, Bugle, Admiral Bailey and Kukudoo. 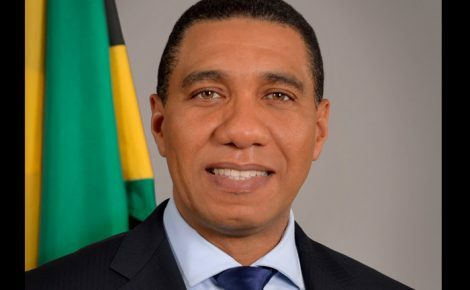 Thousands of Jamaicans, clad in the national colours of black, green, and gold, turned out at the National Stadium on August 6, to celebrate the country’s 55th anniversary of political Independence, at the Grand Gala. Despite the presence of overcast skies and periods of slight drizzle, the event got underway at 6:00 p.m. and ended just after 10:00 p.m. with the much-anticipated display of fireworks. Among the attendees were Their Excellencies, Governor-General, the Most Hon. 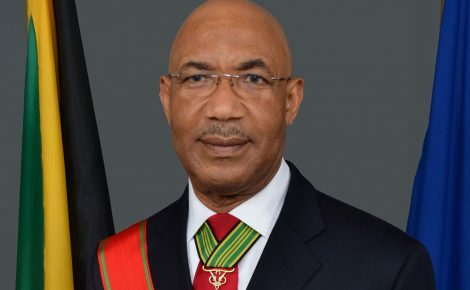 Sir Patrick Allen, and Lady Allen; Prime Minister the Most Hon. Andrew Holness and Mrs. Holness; Minister of Culture, Gender, Entertainment and Sport, Hon. Olivia Grange; Minister of Local Government and Community Development, Hon. Desmond McKenzie; Leader of the Opposition; Dr. Peter Phillips; and other members of the Houses of Parliament and Diplomatic Corps. Former Prime Minister, the Most Hon. Edward Seaga, and Reggae icon, Jimmy Cliff, were also honoured during the ceremony. Speaking in an interview with JIS News, Minister Grange said she was pleased with the different elements of the show. “We had an excellent turnout, in fact, we would have had every corner filled except that the police had their own rules in that people with pointed umbrellas would not be allowed in and so that was an issue,” she said. “But the place is packed, people are enjoying themselves, the spirit is great and we are celebrating our culture, achievements and icons,” she added. “It is important that as a country we celebrate our achievements (and that) we use the opportunity to reflect on where we are coming from, to look at where we are and to look to the future. Our young people are able to understand the culture and learn about their history and their heritage on occasions like these and it is important that we have events like the gala,” she said. Eleven-year-old, Ciara, who was celebrating her birthday, said the event was good. “It’s good that I was born on the day Jamaica gained Independence, because I feel very special now that everybody is celebrating Jamaica 55 and they are celebrating my birthday at the same time,” she told JIS News. She admitted that she was frightened during segments of the fireworks, but said that the overall performances were great. Another patron, John Campbell, who hails from Kingston, said he was home watching the event on the television, because of the weather, but decided to attend with his family. “Seeing the excitement, I just couldn’t afford to miss it, so I just got dressed and came here…I am enjoying the culture and everything that has been presented to us so far,” he told JIS News. Emancipation and Independence activities were held under the theme: ‘Celebrating Jamaicans at Home and Abroad’. The celebrations were undertaken at a cost of $180 million and included the staging of the Independence Village in Kingston and St. James featuring concerts, exhibitions, and other activities.